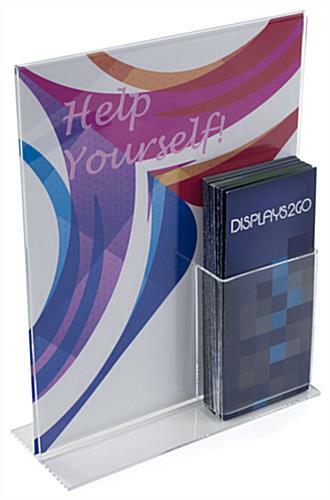 Sign Frame - This sign frame with acrylic brochure display is offered in the bottom/side load "T" style. 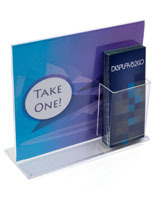 The graphic display holds an 11" wide x 14" high insert. 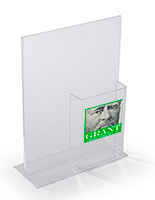 Each unit features an attached brochure holder in the bottom right corner that will fit standard 4" wide literature. 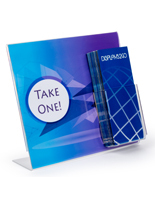 The pocket measures 1.75" deep, so it can hold a nice stack of publications. 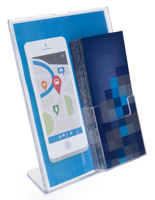 The frame is great as a countertop display for any location! 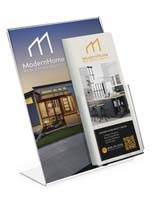 11.0" x 14.0" x 4.1"
This was packaged nicely! The product itself is amazing!!! But unfortunately I am awful with measurements it seems because it is way too big!!! I thought I picked the smaller size but I guess I didn’t so that’s my fault but I really don’t feel like returning it so I’ll be ordering the smaller one next payday. 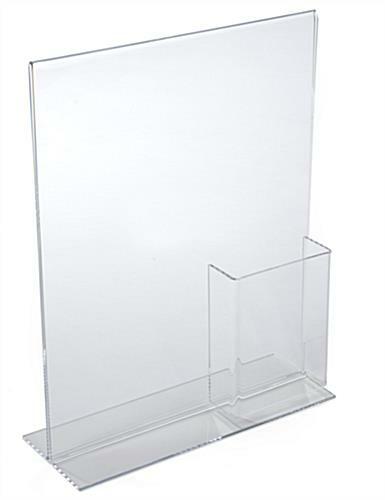 But I highly recommended this product, just make sure you are choosing the right size. 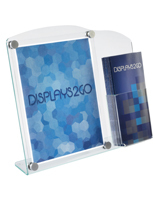 But displays2go is most definitely my new addiction for my business display needs, I have so much stuff in my wishlist! 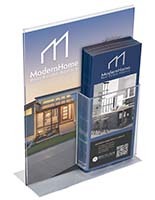 The product was easy to find on the site, and the price was great. Much better than a couple of other places I had looked. Shipping was quick, and tracking information was accurate. I will be purchasing for this site again. Thanks for the awesome review, Shoe Care Innovations! We strive to provide quality products at competitive prices, with quick and convenient shipping, and we're thrilled that you'll be using us again!